Head Coach John Longo of the Notre Dame Fairfield Lancers watches the action during a game against the Simsbury Trojans on Wednesday January 16, 2019 at The Rinks in Shelton, Connecticut. “Coach Longo has (stepped) aside for the remainder of the season due to family and personal issues,” Bleggi said in a text, confirming a CTHSHockey.org report. Assistant coach Bill Garfield, a Lancers alumnus and a member of the school’s athletic hall of fame, takes over on an interim basis for the rest of the year. 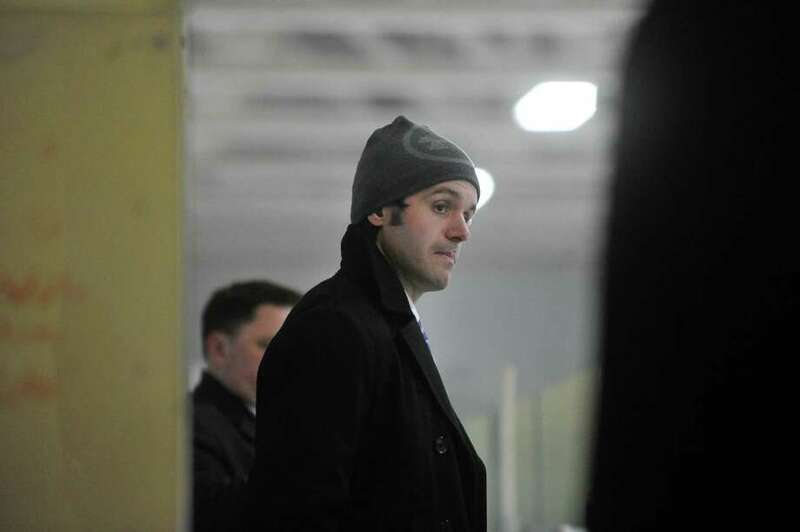 Bleggi said Longo was not behind the bench for Sunday night’s 3-1 loss to New Canaan. Longo took over as head coach last season. The Lancers went 10-12 in his first year, reaching the Division I quarterfinals and losing 4-3 to eventual champion Fairfield Prep, for whom Longo played. The Lancers are 6-9 this season. They beat No. 3 Northwest Catholic on Wednesday night. Longo played three professional seasons in the ECHL after four years at the University of Vermont. He has been a strength coach in the area since his playing career.